I first heard of The Sweet Spot last summer when I took an online class and the instructor used examples from this debut novel. I have to agree, the opening line is awesome! And the story just got better and better. Charla Rae and her husband, JB or Jimmy, are recently divorced. The details are dribbled into the story on a need to know basis. A tragedy is alluded to and Charla’s dependence on Valium is shown. But Charla has to ignore the pills calling to her when she has to take care of the ranch and her Alzheimer’s afflicted father. Charla learns just what she’s capable of. Jimmy already knows what he’s capable of. He’s a big man in the professional bull riding world and he let that go to his head. When their life fell apart, he tried to keep it together, but gave up. This is a seriously good book. 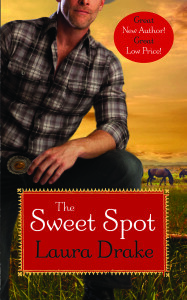 While written with a light and humorous voice and fun secondary characters, The Sweet Spot is not a slight story. There’s heart, depth, and great emotion. I loved it! After last summer’s class, I continued to hear about the book. Then it was a RITA® finalist. Then, in San Antonio last month, Laura Drake won the RITA® from Romance Writers of America® for Best First Book. Because I was at the awards gala as a Golden Heart® finalist (insert demure smile here), I got to see Laura’s shock and humility and hear her gracious acceptance speech. The book is warm and witty and as much women’s fiction as romance. It’s an easy read and well worth the few hours you’ll invest. I highly recommend it. When our television provider had a few preview weekend of several movie channels, I recorded everything I could find that we had missed or I thought we’d enjoy. And we have. Secretariat, The Iron Lady, Charlie and the Chocolate Factory, have all been great. 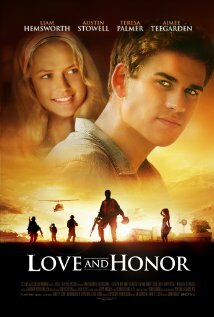 Love and Honor sounded intriguing. Part war story, part love story. Perfect for his and hers movie night. I was so hopeful and so disappointed. Dalton Joiner and Mickey Wright are platoon mates in Vietnam. They are shown on the job, joking around, and under fire to establish their relationship as buddies. They earn R&R in Hong Kong and are released by their CO for a week. But Dalton just received a Dear John letter from his girlfriend back home so he jumps on a plane to Michigan instead of staying in Hong Kong. What’s a friend to do? Stay and enjoy a week in a city full of women, booze, and soft beds or follow his friend? The two arrive in the states and find Jane’s home only to discover she’s now called Juniper and she lives with a bunch of anti-war protesters who demonstrate and put out a rebel newspaper. One of the other girls in the house is Candace and she and Mickey spark. I’m not even going to bother with the rest of the plot. Dalton and Mickey’s hair cuts were not regulation army in 1969. The wardrobe was what a costumer pictured young adults wore in 1969, not what they actually wore. The ending was contrived for the “Ahhh…” but fell far short. It’s apparent why we missed this one in the theaters. I’m not Natalie Cole so I think I’m eminently forgettable. I’m a fairly quiet and reserved person by nature. Combine that with the fact that I have one of those annoying brains that remembers the most arcane and useless info. I remember dates, places, people, names, and facts. But often the truly important eludes me. It’s a common occurrence for me to be introduced to someone I’ve already met who says, “Nice to meet you,” as they extend their hand. The other half of the time, I shake their hand and say, “We actually met before.” Then I tell them where and when and all kinds of other details. She looked at me like I said King Kong was coming up the stairs behind her. Apparently, I’m a bit more memorable than I thought. So my next question is: Am I memorable because of something good or something bad? I hope it’s for something good. I try to be circumspect and encouraging in my online communication. I don’t always succeed though, so there’s a chance I’ve said something scurrilous and brought a bad memory to mind. What about you? Do you remember names, dates, faces? Or do you meet new people all the time, even when you’ve met them before? For a few of my favorite authors, I’m a total fan girl. Nora Roberts is one of them. I got the opportunity to meet her last month in San Antonio at the Romance Writers of America (R) annual conference. I’ve read several of her stand alone romances and enjoyed them but I love her J.D. Robb … In Death series. 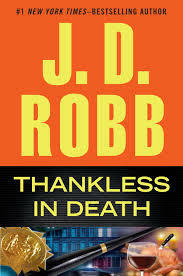 She signed Thankless in Death for me and I just finished it. This series just gets better and better. I teared up at the end. This book is seriously good. It’s approaching Thanksgiving in New York City in 2060. Lt. Eve Dallas is kinda-sorta looking forward to the holiday. Roarke’s Irish family is about to descend on them. Of course, Eve gets a murder case. A couple murdered in their home. The prime suspect is their son, a perpetually petulant and selfish man who blames his life (or lack of one) on everyone else. It’s never his fault that he gets fired, even though he’s late to work most days. The son sets out to avenge all his perceived slights on the friends and family he holds responsible. Eve and the team work tirelessly to find him and catch him before he kills again. What I love about this series is not just the characters and the stories, but the humanity Robb brings. Eve is not a perfect character. She’s wounded but she’s finding healing in her husband and new family and friends and her work. She takes her work very personally and it makes her good at her job. The victims matter to Eve. I got a bit teary at the close of this book when Eve had to fight down her own emotions. She’s getting better at acknowledging her feelings and facing them. If you’re a fictional character in 2060 NYC, Lt. Eve Dallas is the cop you want working your case. Who’s your favorite fictional cop? Besides Eve Dallas, I really like Magnum P.I. Because really, Tom Selleck? I’ve never been a Tim Burton fan. I think I just don’t get him. Edward Scissorhands? I wanted to love it. Failed. But even I have to admit that pairing Tim Burton with Roald Dahl is genius. Add in Johnny Depp and the result seems guaranteed. I held off seeing the 2005 movie Charlie and the Chocolate Factory until recently. 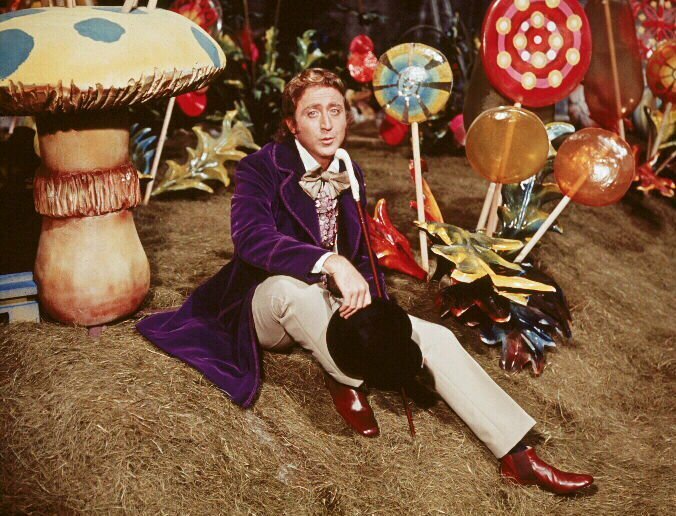 The first movie adaptation, Willy Wonka and the Chocolate Factory, starred Gene Wilder in the title role and was released in 1971. I was twelve-years-old and had loved the book since my classroom teacher read it aloud a few years previously. I didn’t love the movie immediately. But it did grow on me and I have a fondness for it now. I didn’t expect to enjoy the 2005 Tim Burton and Johnny Depp version so I didn’t bother to watch it when it was released. The good: Burton and screenwriter John August kept the story closer to the original novel. The (ironically) bad: The story as Dahl wrote it, was quite dark. It’s still dark, yet accessible. Children know the world is a dark and scary place and Dahl never condescended to his youngest readers. The movie holds to that standard. The ugly: I had to humble myself and admit it’s quite good. I still wouldn’t call myself a Tim Burton fan, but I certainly appreciate him and his work more now. What movie or book forced you to change an opinion after you saw or read it? This is a busy week of releases and I’m pleased to offer a bonus spotlight on Amy Patrick. Amy is a fellow 2014 Golden Heart® finalist. 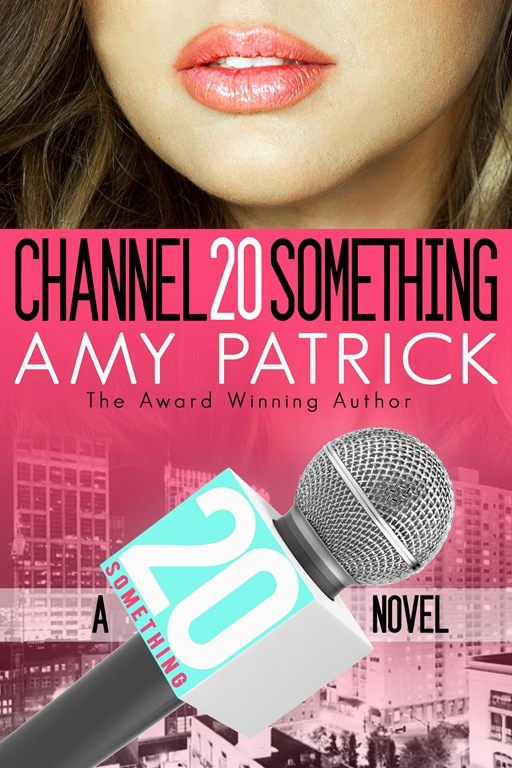 Her debut novel, CHANNEL 20SOMETHING, is now available. Be sure and read to the end for a chance to win an electronic copy of CHANNEL 20SOMETHING. Amy is a two-time Golden Heart finalist (2013 and 2014) who writes Young Adult fiction as Amy DeLuca and New Adult romance as Amy Patrick. She lives in Rhode Island with her husband and two sons and actually craves the heat and humidity of Mississippi where she grew up. 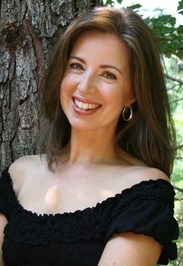 She’s been a professional singer and news anchor and currently narrates audio books as well as working as a station host for a Boston TV station. Amy, tell us a bit about yourself. For many years I was a news anchor, working at 6 different stations in 4 different states over the course of 12 years. Now I’m a station host at a Boston TV station, I do voiceovers for radio and TV ads and narrate audio books, and do freelance video work. It’s all very interesting in its own way and inspires so many story ideas I’ll have to work into my nineties to actually write them all. How long have you been writing? I started trying to write a novel during my first year out of college, but stalled out a few chapters into it. I had no idea how to write a novel! Unfortunately, I took only Journalism courses and NO creative writing in school. I know—what was I thinking, right? I guess I just never thought a fiction writer was something I could be. But the writing bug wouldn’t leave me alone. I started several more novels over the years. Finally, after leaving my full-time TV news career, I started learning the craft of novel-writing. I finished my first novel in 2010 and started pursuing publication then. I started writing on a more-or-less full-time basis about a year ago. Tell us about CHANNEL 20SOMETHING. 22-year-old Heidi Haynes is almost one year into her “real life.” She has her first reporting job, her first apartment, and a comfortable relationship with her college sweetheart. But for some reason she’s not as eager to talk about walking down the aisle as he is. Heidi would be so much more comfortable if she could simply ignore Aric. He’s just her type—the type she’s so careful to avoid these days. But that becomes impossible when she’s forced to work closely with him on the weekend newscast. Now the attraction between them is growing even faster than the ratings, and what happens behind the scenes is the real news. Sounds sooo fun! Is CHANNEL 20 SOMETHING your first book, or have you written anything else? CHANNEL 20 SOMETHING was actually my 3rd book, though it’s the first to be published. The first one I wrote was a Young Adult fantasy (with lots of romance). It was a finalist for the RWA Golden Heart award in 2013. My Young Adult murder mystery (with lots of romance) FOUR BULLETS, is now out on submission to publishers. It was a Golden Heart finalist this year! Since finishing CHANNEL 20 SOMETHING, I’ve also written two more books in the 20 SOMETHING series. Book 2, STILL YOURS, is Mara’s story and takes place in Providence and Newport, Rhode Island. Book 3, Kenley’s story, STILL ME, takes place in Atlanta where Kenley lands a job at the network. When do you like to write, and where do you write? I wish I was one of those super-focused people who can write anywhere anytime, but I’m the world’s worst multi-tasker. I can edit at home, but for first drafts, I banish myself to the library. There’s a particular chair in a particular corner—in the far back, facing a boring wall. No internet access. No temptation. I sit down and the words flow. They know they’re supposed to turn on when I get to my hidey-hole. Do you have any advice for someone who wants to write a book and become published? I’ve seen the statistic that 90% of people want to write a book and only 10% actually do. I think lack of know-how stops most people. So my advice would be to join a great writer’s group like RWA (Romance Writers of America) and a local chapter. It’s such a great resource for information on good writing as well as for support. Having writer friends to trade work with made an incredible difference for me. I also enjoyed writing more and had more success when I got a firm grasp on story structure. I loved the book Save the Cat by Blake Snyder for that. It’s very accessible and clear, besides being funny and enjoyable. When I read it, a light bulb went off for me. Thank you so much for having me here today. I’ve had a great time, and it’s an honor to be featured on your blog! For a chance to win a free electronic copy of CHANNEL 20SOMETHING, just leave a comment and tell me about your first job in the “real world.” A commenter will be chosen at random. 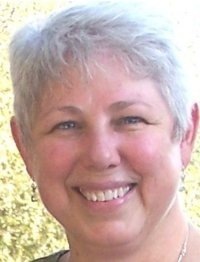 I’m pleased today to shine the spotlight on Lynette Endicott. Her newest release, Protective Instinct, co-written with Tami Dee, is now available. Be sure and read to the bottom to enter a giveaway Lynette and Tami are sponsoring. Because she didn’t have pets until after her 50th birthday the animals she enjoys find their way into all her books. Usually you will also find a character with a disability as part of the day-to-day fabric of the story. In More Than A Job, Paige works in services to people with disabilities until she loses her job and starts over. In The Return of Joy, Atlas, the yellow lab, becomes a Therapy Dog. In the Time After Time series animal helpers assist the hero and heroine in all six of the books in the series. 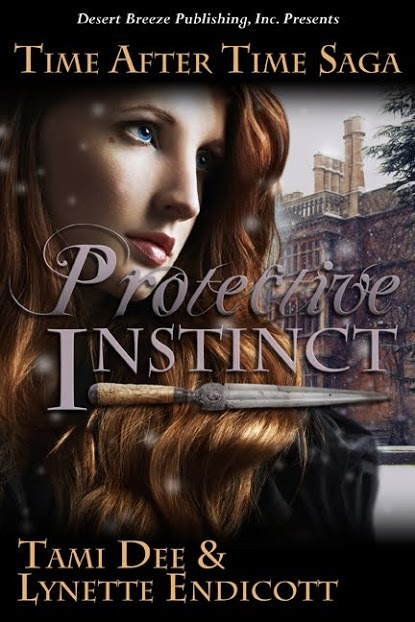 Protective Instinct is the fourth book in the Time After Time Saga with Tami Dee. An enemy is thrown through time — not in chronological order — to find the women of the Heartmark and prevent them from finding love. Young Sabrina, this book’s heroine, treasures her heart-shaped birthmark and the heritage it represents. She is watching and waiting eagerly for the man who will rescue her, to give him an ancient artifact that will seal their love. This is very confusing to soldier and spy Nick, whose job is to determine if Sabrina is their enemy, learn what she knows and then dispose of her. My dog Ollie and I volunteer at the local library as a team. The children read out loud to him. I also collect castles and grow flowers. Maya Angelou’s I Know Why the Caged Bird Sings. I was fascinated to see how her creativity blossomed in a time when much of the world around her attempted to limit it. Your favorite motivational or inspiring quote? Typical day? There is no such thing. I have a hectic day job consulting across six time zones, so am on the phone, computer or traveling a great deal. My WIP is on my tablet, and I take it out whenever I can. Typically I write like mad for a week or so, until a rough draft is finished, then go back and edit, layer in descriptions, and make some of the descriptive passages dialog. I tend to write better in the evenings while the family is busy with TV — if I happen to be home. When I am traveling typically I have my evening free to write and that is a wonderful luxury. I go back and forth. First I jot down a very rough idea of the book. I identify specifics about the main characters, decide what they look like, decide where the book is set. Then I sit down and write. I refer to my notes for the details that I need to remember so I don’t change the hero’s eye color, and I definitely write by the seat of my pants. When I keep writing, even when I don’t know the details, the rest of the story unfolds out of another place, not a plan but something more organic that the characters tell me as I go. Then she discovers he is the cruel owner, and that the company she loved — the company that cared so much about the adults with disabilities who lived in their homes — is in a downward spiral that puts the life of one of her friends at risk. When Joy Huffman’s recurring dreams of the husband she lost become urgent she is convinced to go tot he cabin, their project of love, in New Mexico. With her daughter and mother-in-law, they set out to learn what Steve wants them to know — that his death was no accident, but murder. Their investigation stirs up the evil that ended his life, and puts them all at risk. The caretaker at the cabin, Mark Stone, is challenged to keep them safe while he unravels the mystery of why Steve died. Along the way he falls in love with Joy — but will she be open to loving again? Jennifer has the perfect life — a loving husband, a beautiful daughter, a flexible job in the family business. When a heart-stopping accident takes it all from her, Jen struggles to survive her days alone. No one else understands, expecting her to “get over” her grief. Ollie, her daughter’s rescued dog, is the only one who shares her grief and lives her pain. When divorce ends in the sale of their home, she and Ollie set out on a road trip of healing and discovery. Life will never be the same, but maybe along the way she can find the music, find her voice, find her own path to living after her loss. And if she is lucky, find love. Brian Van Pelt has barely survived an anguished year of loss, hiding his sorrows under the facade of a cool and uncaring attorney. Not able to deny his grief any long, heartache drives him to collapse and his life takes an unexpected turn. Despite her interest, she has her own pain, supporting her niece Sara, who has a virulent cancer with aggressive treatments that take such a toll they would not be worth it — except they are Sara’s only hope of survival. On Detective Sean Barnett’s first day at work his police dog’s reaction to a bee sting requires an emergency visit to the town vet. Dr. Al’s swift, efficient response averts immediate danger, but when Sean asks Allison to dinner, he opens the door for a terrifying danger — an ancient, time-traveling enemy who will stop at nothing to keep them apart. Dr. Allison Green’s heart-pounding attraction to King’s handsome owner, Sean, sends her to her family’s reference on love, the diary passed down from her great-grandmother that goes back centuries. She delves into references to animal helpers, ancient artifacts and the ruthless woman whose goal is to destroy love for the woman of the Heartmark. When she is overwhelmed with ancestral memories, Allison realizes the extent of the danger posed by their enemy, and the deranged terror that threatens her chance at love. Tough as nails San Francisco homicide detective Winter Parker runs fast and far to escape ancient threats of revenge, and small town torments. Can equally tough Special Agent Mike Hunter convince Winter to put aside her fears and take a chance on him and their small town? Will ancestral memories help them overcome a time-traveling enemy whose sole purpose in life is to seek out the Heartmark women and destroy their chance to find– and hold onto– true love? Eliza O’Malley and brother Allen travel from Ireland to join their father and brothers on an 1880s Wyoming homestead. Allen is almost destroyed during the voyage, but Eliza’s benefactors rescue them both from their father’s foolish carelessness and mounting debt. Clues from an ancient diary, the fierce intervention of animal helpers, and ancient artifacts play a part in the life of all Heartmark women, including Eliza. Will they be enough to overcome the horrible rumors spread by Jude and restore Frank’s love for her? Three more books in the Time After Time Saga will be released in the future: Maternal Instinct (April 2015) and Primal Instinct (December 2015). 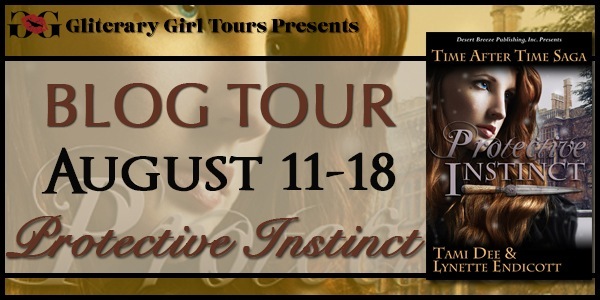 To celebrate the release of PROTECTIVE INSTINCT, Lynette and Tami will be giving away a $20.00 Amazon Gift Card to one grand prize winner, a $10.00 Gift Card to either Starbucks or Teavana to the second runner up and an ecopy of PROTECTIVE INSTINCT to the third runner up. Enter the giveaway every day for more chances to win. All entries must be received by August 18th before midnight.